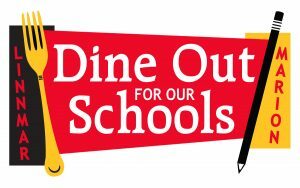 Dine Out For Our Schools had a very successful 1st year and it returns on Thursday, April 18th, 2019. The Linn-Mar School Foundation hosts this district-wide effort with proceeds benefiting the Foundation’s K-12 classroom grant programs which impact each Linn-Mar school. Promotion applies all day for most locations, includes dine-in, take out and delivery. Dining patrons must mention or show the Dine out flyer (printed or on phone) prior to ordering for the Foundation to be eligible for the donation. Thank you to our participating restaurants and thank you for dining out for Linn-Mar students! Visit www.linnmarfoundation.org for more information.